Foggy Bottom is located in the northwest quadrant of Washington, DC and is one of the oldest and most historic neighborhoods in the District. Its iconic name stems from its roots as a waterfront community dominated by the fog and industrial smoke from the glass and city gas factories operating there during the early 19th century. Read more about Foggy Bottom real estate. Today Foggy Bottom is home to a variety of mid-rise condo buildings as well as the more traditional row houses. Luxury developments include the Watergate Complex and The Plaza. 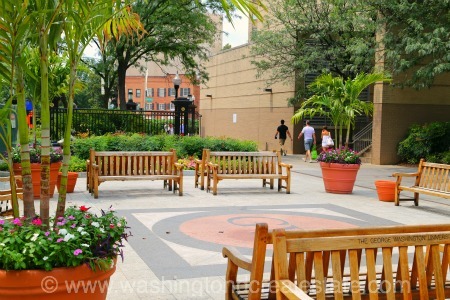 Foggy Bottom combines landmarks such as the John F. Kennedy Center for the Performing Arts, the George Washington University , the World Bank, and the State Department with the ease and convenience of nearby Georgetown for shopping, restaurants and clubs. Foggy Bottom is served by the Foggy Bottom-GWU Metro Station and is bounded by 17th Street to the east, Pennsylvania Avenue to the north, Constitution Avenue to the south and Rock Creek Parkway to the west.